ABC’s hopes for AMERICAN IDOL diminished. ABC: AMERICAN IDOL fell half a point from Sunday’s premiere to 1.8, dropping below NBC. That’s still a good number these days, but IDOL has always tended to fall from its opening episodes, and this edition doesn’t have far to go before it becomes problematic at ABC’s price point. On the plus side, THE GOOD DOCTOR returned from a week off with a half-point bump to 1.8. NBC: THE VOICE slipped 0.2 to 2.3, and GOOD GIRLS was down 0.2 to 1.1. 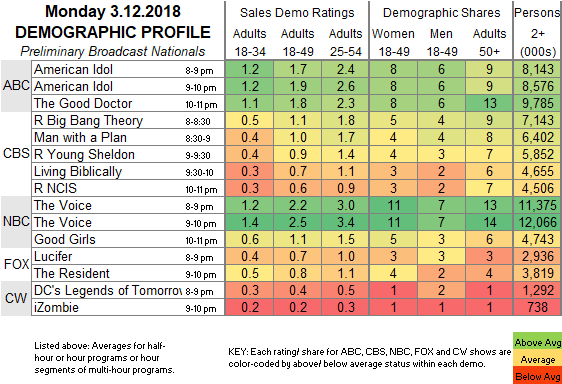 FOX: LUCIFER held at 0.7, and THE RESIDENT lost 0.1 to 0.8. CBS: Only MAN WITH A PLAN and LIVING BIBLICALLY were new, and they were steady respectively at 1.0 and 0.7. The reruns were in the 0.6-1.1 range. CW: LEGENDS OF TOMORROW (0.4) and IZOMBIE (0.2) were steady. It’s a busy night tonight. NBC follows the season finale of THIS IS US with the premiere of RISE, while ABC launches the new ShondaLand series FOR THE PEOPLE. 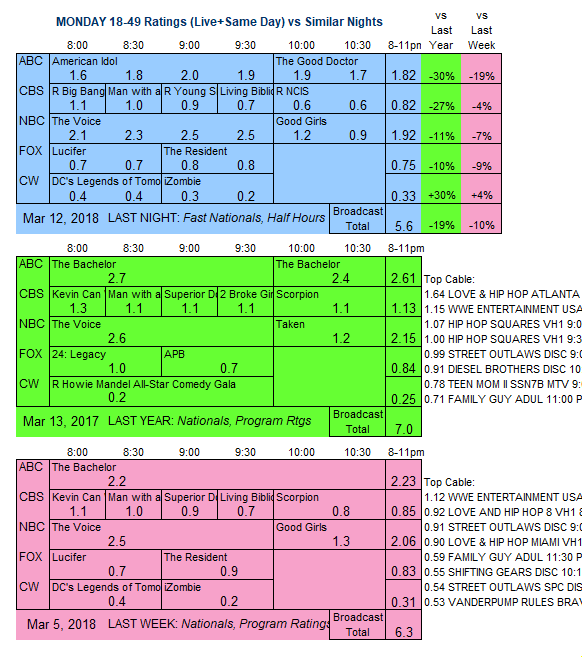 On cable, Freeform’s THE FOSTERS airs its not-quite-series-finale episodes (3 more hours are scheduled for summer to lead into the new spin-off), and WGNAmerica’s BELLEVEUE ends its limited run.